Google has put over 200,000 miles on its autonomous vehicles in the stark environment of Nevada during the past two years, reflecting the duty in an even harsher landscape of the autonomous border patrol vehicles that have been patrolling Israeli borders for the last five years. 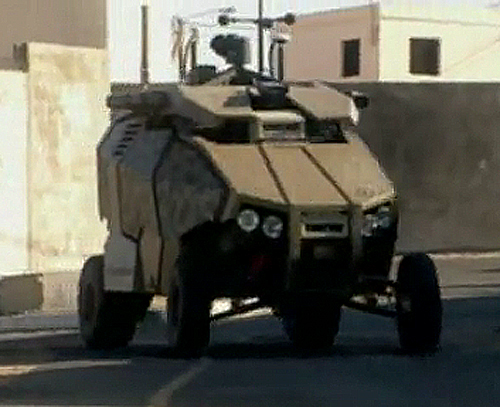 The military border robotic patrol cars are built by a company called G-Nius and utilize a three-level computing system to operate the vehicle, scan the surroundings, and formulate responses to what it encounters, according to a post by TechNewsDaily on news.discovery.com today. In the late 1960’s a popular comic artist named Vaughn Bodé penned a visionary exploration of robotic warfare and what it might entail, titled The Machines. In his work, Bodé envisioned a world where robots had replaced men in combat, defining several different models to take the place of traditional armed forces. These included the Punkerpan BiPod, an armed two-legged replacement for the infantryman. These were expected to be relatively inexpensive and thus somewhat expendable. What Bodé called RamDoves were self aware flying implements of warfare, effectively predicting the Drones the US uses to pinpoint and take out targets in the war on terrorism. These robotic warriors were all controlled by a self-mobile bunker, referred to as the Mother Complex. So when I chanced across the TND piece on the autonomous border patrol vehicles in Israel it reminded me of Bodé’s vision. The article's authors spoke with Hugo Guterman, a researcher at Ben-Gurion University of the Negev, who helped develop the computer system for the autonomous military vehicles. “These cars have taken the place of some soldiers on the front lines, preventing them from possibly facing gunfire or confrontations,” he said "By removing the people from the front line, actually you are saving lives." In the story they ask him if the vehicles are armed and he declines comment, but you need not ask to know they most likely have two way communication with anyone the vehicle encounters and the higher level of the computer analyzes threat levels and computes multiple response scenarios which the Mother Complex can implement or override. Then again they can send in a RamDove, that is a military drone, to gather additional data and add to the response options. The vehicles patrol remote desert areas so it is unlikely they will encounter peaceful citizens, meaning anyone they do discover is suspicious already. You may have heard of The Urban Challenge project that is intended to enable the military to have a full third of its vehicles autonomous by 2015. So the next time you are strolling in the desert to clear your mind and cleanse your spirit, be careful where you wander. Having a JackTurret pop up before you can really take the chill out of your day – just like having a drone all up in your grille.